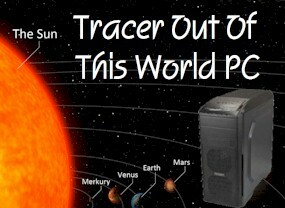 AudioCenter Out Of This World PC - Tracer Technologies Inc.
You can buy a very fast and capable Mustang GT for a bit over $30K. There?s a big market for this car and there are a lot of people who can afford it. So why in the world would people line up to pay $50K MORE for one? The answer is that Ford offers something beyond the ordinary for those who can appreciate it ? the Mustang Shelby GT. You basic (and great) GT is almost totally gutted and upgraded in every area from the seats, to the sheet metal, to the tires and, oh yes, to the 750hp supercharged monster under the hood. Not everyone will want such a super fast car, but for those who do, the price won?t stop them. The same is true with PCs. Over the years, we?ve specialized in offering hand built computers that perform much faster than normal. This is the kind of speed just about all of us can appreciate and use. Most of the time, we?ve tried to offer the best value as well as a very fast machine. Our machines were kind of like the normal Mustang GT ? fast but not insane. Well, it?s time to get crazy. We recently set about to design a system that is not just super fast, but is advanced in many different ways. Introducing the Out of This World PC. Intel I7-6700 CPU- This is the new 6th generation Skylake cpu that is beyond popular right now. As we write this, these are on backorder everywhere, but we expect supplies to become available very soon. We love AMD and this is an expensive CPU, but we don?t care. It?s just great. Insanely great. Closed Loop Cooling- How to keep the monster under the hood cool? A closed loop liquid cooling system, of course. These are perfected today and there is no danger of a mess. Cool system temperatures maintained even under heavy computing loads and it?s very, very quiet too. 250G M2 Boot Drive- An SSD boot drive is required, right? Sure, but not any SSD drive ? a brand new 250GB M.2 drive. Normal SSDs connect to the normal SATA buss and their speed is limited by it. Our high end motherboard allows this special SSD to connect with a 4 lane high speed buss. Normal SSD drives can read at about 500mb/second. This can read at 1900. That?s supercharging! Support for Two monitors- One HDMI and one DisplayPort 1.2 with resolution up to 4096X2304 full 4K! How about audio?- This uses a high end audio chipset with shielding to limit noise to 94dB down. Also includes an ?anti-pop? relay to mute the audio on power up and down. Headphone amp included!- This automatically senses and adjusts itself to your headphone impedance (32 to 600 ohms) for maximum energy transfer. Overclocking is easy - Just about every item can be tweaked if desired. There is even a motherboard button to automatically fine tune memory timings to make them optimal. Latest UEFI bios that can be reloaded from a thumb drive- Accessible via a back panel button ? even a non-booting computer can have its bios refreshed. There?s a lot more to this machine, so call with your questions. Oh yes, the price. It?s a lot less than a Shelby GT. Our Out of This World PC is $2199, and like always, they are built by hand, burned in and tested.